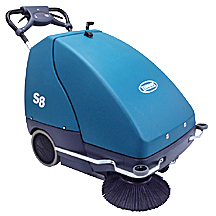 The TENNANT S8 is a battery powered walk behind sweeper. Its compact, durable design will clean even the harshest environments. The TENNANT S8 features roto-moulded covers, high efficency intake impeller, and large removable debris hopper.